Can I just be a total “basic babe” right now and proclaim that fall is my absolute favorite?! It’s the loveliest season weather-wise here in Texas, and there are so many festive things to do, see and smell when you’re craving all things autumn. Today, it’s all about planning some fun fall playdates for the little pumpkins in your life. So grab your best mom friend, order yourselves a grande PSL, open up your planners, and be sure to pencil in these autumnal outings with your favorite little playdate crew! 1. Collect fall leaves on a nature walk. 2. Visit the Natural Science Museum. Some of my favorite fall days are the rainy ones! An exceptional solution for staying dry and warm is an indoor activity children adore at any age: a trip to the museum. When we meet our friends for museum playdates we always do the same thing — we start with the exhibits, make our way down to the kid’s level where the littles can really let loose, we grab lunch at the cafeteria, and when everyone is nice and tired, we retreat to the dark and quiet film theater where inevitably the kids pass out one by one. And let’s be honest, that glorious nap makes all of the museum efforts totally worth it! 3. Spend the day at the state fair. Did someone say fried foods and petting zoos? The state fair is preschool paradise! From sweet snuggles with little lambs to snacking on fried Oreos, to climbing on tractors and riding the Ferris wheel, I can’t think of a better way to spend a beautiful fall day with friends. Be sure to check your fair’s daily schedule as many offer activities specifically geared towards the toddler set. For instance, we lucked into a Mother Goose story time that all of the littles loved! 4. Play at the pumpkin patch. Is it just me or have pumpkin patches exponentially improved since we were kids? Long gone are the days of parking lot pumpkin patches in front of the grocery store. Honestly, they are so charming now and truly a fall destination. I love all of the fun photo opportunities, the corn mazes, and hay rides. It’s a great time for families and friends, and it’s perfect for playdates or a large group! We can’t wait to get our play date pals together for these amazing autumn gatherings soon! After all of these fall happenings, mama’s going to need a cocktail! 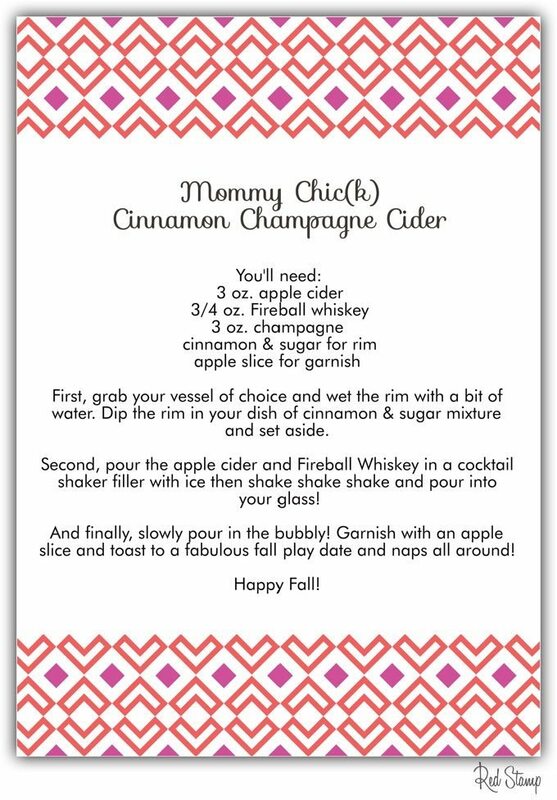 I couldn’t very well share play date ideas for the littles with out something fabulous for my mommy chicks, so I’m sharing a festive fall drink recipe that will be a sweet ending to a successful day of momming…Our Mommy Chic(k) Cinnamon Champagne Cider!